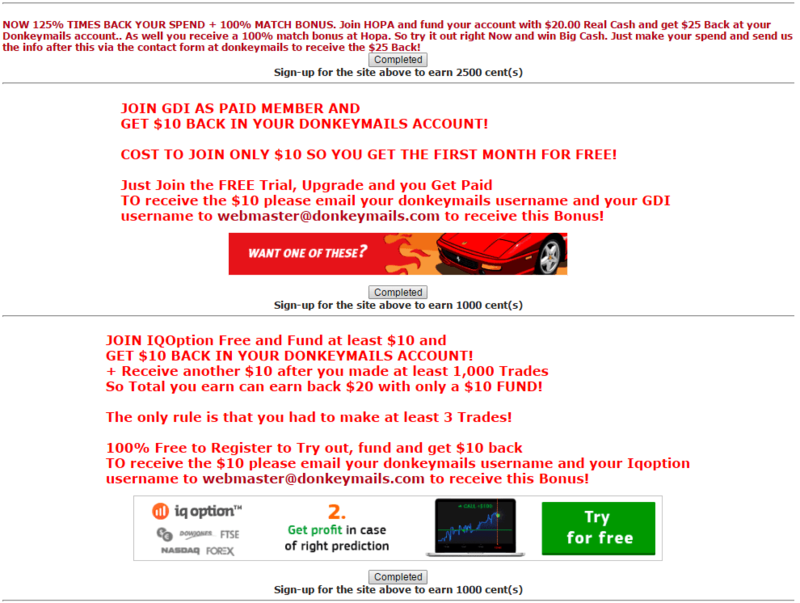 Donkey mail is one of the genuine most trusted PTR, PTC site started on 2005. Here you will be paid to read (PTR) i.e. you can earn money by reading e-mail and paid to click (PTC). Other than ad clicking you can earn through PTSU, promotion, offers etc. One of the best feature of donkey mails is you can withdraw your earnings even if it is $0.000001 and even less, no minimum payout. Donkey mails the only PTR site that offers 5 level referral facility which is explained later. Registration link – Donkey mails. USA members are paid to complete the offers at the right side of the page. Not valid for people from other part of the world. On the home page click sign up or directly enter your e-mail address if you see a box as shown below. A verification link will be sent to your e-mail inbox as shown below. Click that verification link to start registration. When you click it you will be taken to the registration page as shown below. Choose your desired username and select both “Site Inbox & email” in send email to option, only then you will receive paid e-mail to both e-mail inbox and donkey mails account inbox. Fill all your personal information like your name, address, residence etc. Select all the options in the categories of interest. Only then you will receive more mails, means more earnings. Don’t tick Adult 21+ if you don’t want to receive mails regarding adult content. 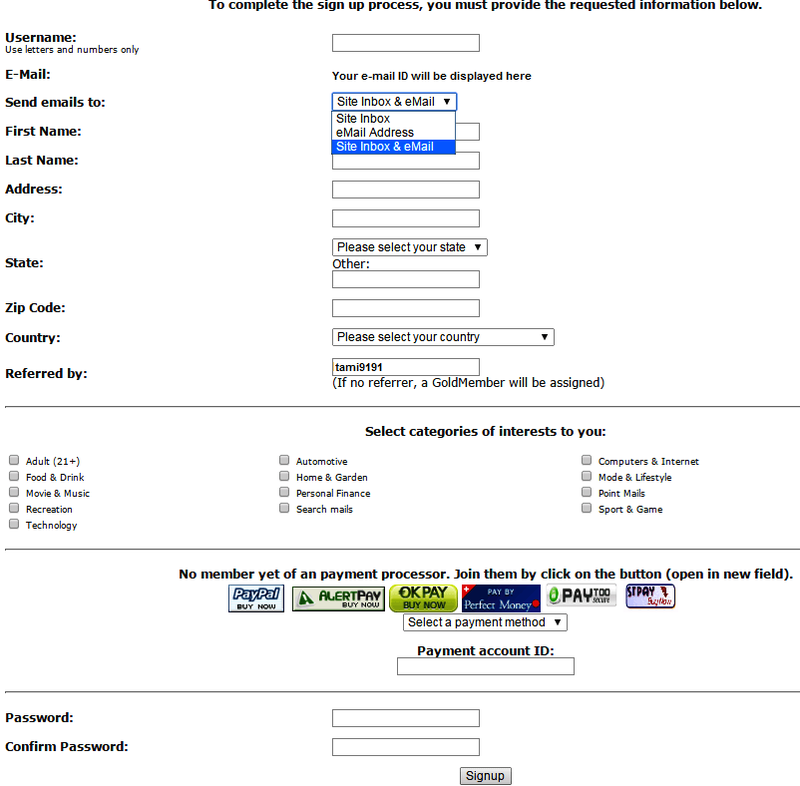 Select a payment option and enter your payment e-mail ID below that. Choose a password of your desire. You should remember the username and password to log into your account in future. Click sign up to complete the registration process. Once you complete sign up, log into your account to start earning. Initially any paid e-mail will be there in both inbox. In mean time you can continue with PTC ads before you get paid mails. 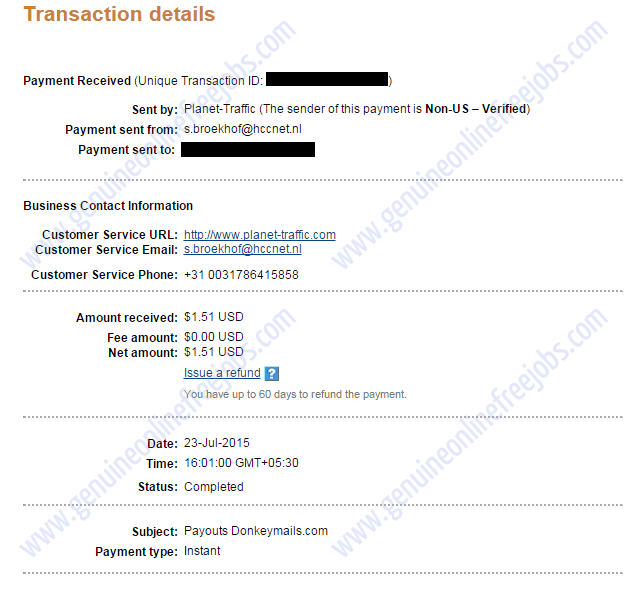 After some hours you will get paid mails as shown below. The donkey mails will contain several links as shown above. To get paid click only the link below the paid ad indicated in black oval. You can find two links below that click the link that is pointed, you will not be paid even if you click the other link. Don’t click the non paid ads indicated in red oval. It’s the waste of time as you will not be paid for that click. Don’t click donate link indicated in yellow oval. If you click that link $0.001 will be deducted from your account. Click that only if you really want to donate donkey mail. Once you click the link below the paid ad a new page will load as shown above, click the correct matching numbers to continue with the advertisement as shown below. You have to stay in the page for 15 seconds to get paid. No timer bar will be available as seen in most of the new PTC site. After 15 seconds you will get a message as shown above. You can close the page and continue with other PTR or PTC ads which is explained below. Even though if you din’t get mail in your primary (ex. g-mail) inbox, some paid mails will be available in the donkey mail account inbox named as ‘your inbox’. Check it regularly. If the paid mail is not clicked for 7 days it will be automatically deleted. Be a active member of donkey mail. Look here : Tired of $0.00025 for reading a e-mail, get $0.02 for checking each e-mail. 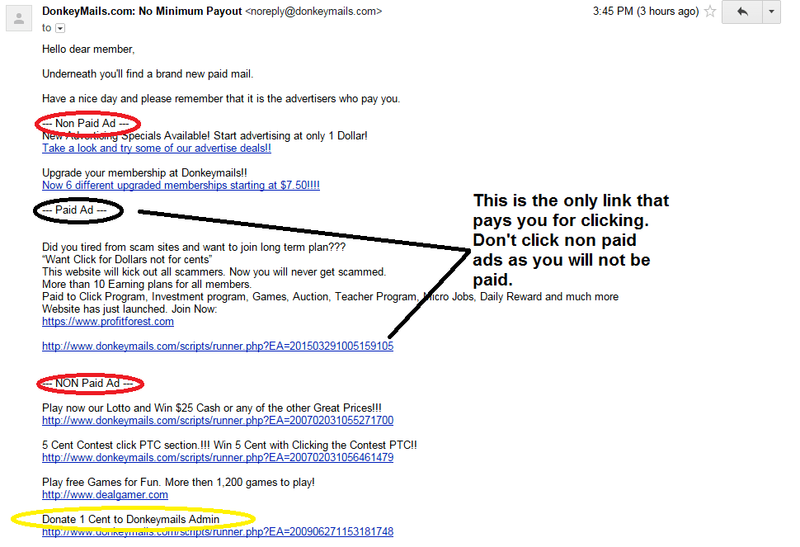 Clicking PTC ads is other way to earn money in donkey mails. Click ‘paid to click’ to start, paid to click ads are displayed as shown above. Follow the same procedure as done for PTR ads. Get paid for reviewing websites. 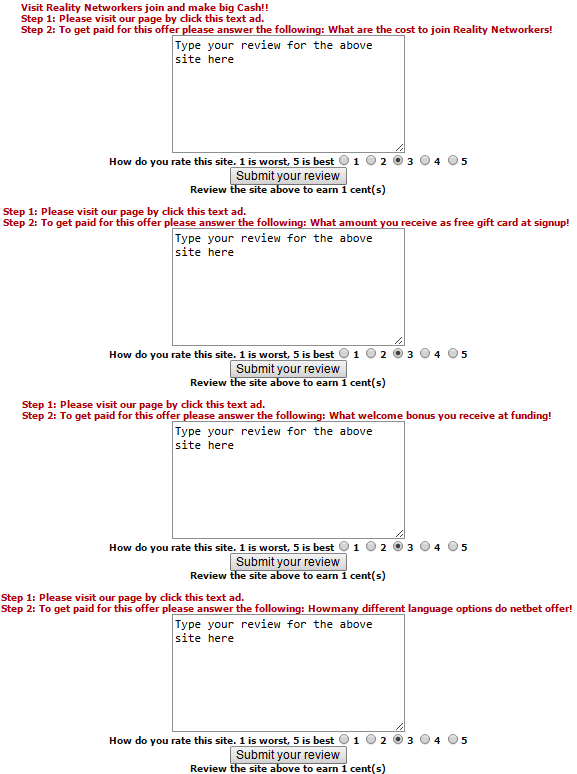 Click “Get paid to review!” to see the available offers as shown below. Click the text ad to see the advertisement. Take a look at that website, come back to this page and write a review & rate that website between 1 to 5 and click submit. Your account will be automatically credited with $0.001. Earn up to $10 for completing each paid to sign up offer. Click ‘paid2signup’ in the home page to view the available paid to sign up offers as shown below. Complete these offers and also place the verification code in the box and click submit. After review your account will be automatically credited. If you are from tier 1 countries like Australia, Austria, Belgium, Canada, Denmark, Finland, France, Germany, Greece, Iceland, Italy, Netherlands, New Zealand, Norway, Portugal, Spain, Sweden, Switzerland, United kingdom, United states of America you will have special paid to sign up offers. Click “paid2signup search countries” to view special offers with high pay rate. As said early donkey mails is the only PTR site that offers 5 level referral facility. You will be paid for your referral’s clicks. The percentage of commission per level is 10% – direct referral, 5% – indirect referral or direct referral’s referral, 3% – third level referral, 2% – fourth level referral and 1% from 5th level referral. Tips: How to get more direct referrals. Paid to promote is an simple way to earn money. Post your referral link in your approved website, blog, social medias etc. You will be paid of some one clicks that link. If the click is made by a person from tier 1 country you will be paid more. Donkey mails does not accept spamming. Don’t post your referral link alone in social medias, tell something about it. You will also have a chance of getting a new referral down line. Complete the offers to earn more money. Click offer wall to view the available offers and click the offer, complete it, get paid. Get a chance to win $25 by playing lottery. Donkey mails pays your earnings through anyone of this payment processor Paypal, payza, perfect money, egopay, sensipay, OK pay, solid trust pay. There is no minimum payout for okpay and sensipay. The minimum payout for Paypal, perfect money and egopay is $1. Payza minimum payout – $1.06 and solid trust pay – $2.50. Click here – Join donkey mails. You might like this : Get paid for participating in surveys. Tags: Registration procedure donkey mails, How to register, Is donkey mails legit? How to work and earn money through donkey mails.